It’s not about Pickles! 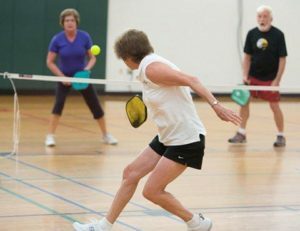 Pickleball is a fun game that is played on a badminton court with the net lowered to 34 inches at the center. It is played with a perforated plastic ball (waffle ball) and composite paddles. It is easy for beginners to learn, but can develop into a quick, fast-paced, competitive game for experienced players. It can be played in singles or doubles format (like tennis, but on a modified court with modified equipment). Pick up games are available Monday through Friday from 7:00-10:00 am for singles or doubles play.